The Crowle of my Boyhood. Taken sometime in the early fifties. Starting at the bottom left hand corner, beyond the row of trees and alongside Johnson’s Lane is the fair field. It belonged to Wroots the fair owners, the annual Crowle fair was held there as the same time as the carnival, gymkhana and children’s sports day. During the war (1939 – 1945) the latter became War Weapon’s Week. Originally the fair had been held in the Market Place, I just have vague memories, but moved to the field about 1940. A few years later Mrs. Wroot would build a bungalow in the top left hand corner and the field was used for wintering the fair equipment gradually deteriorating into a junkyard as fairs became less popular and unused equipment was left there. Next is the Tythe House, which had been the convent with a very active school for young ladies. Shortly to be demolished and replaced by an estate of flats and other accommodation for older people. Conservation has been somewhat tardy in reaching Crowle; a historic building such as a Tythe House would now be conserved. The same applies to the High Street, the majority of the old shop fronts have gone as shops have been converted to houses, to be replaced by characterless walls, only recently has it been necessary to preserve the front and doorway of a shop when converting to a house. Now it is probably too late, the owners would not do it voluntarily, but it is a pity that grants cannot be provided to replace the old shop fronts and bring character back to the street. Along the Tythe House is what used to be known as Vicar’s Walk. The large white mansion on the corner is the Old Vicarage with its large garden. A suitable residence for a gentleman on an income in 1890 of £1,100 per annum when most lived on £50 per annum. The New Vicarage can be seen to the right of that block and the War memorial just to the right of its roof. The St. Oswald’s Church, with the graveyard only recently cleared of Headstones. The cemetery had opened about 1850 so that there were now no relatives who remembered family members buried there. There was only one a sprightly old gentleman well in his eighties whose name I cannot remember. Always smartly dressed with highly polished boots. Those were necessary because he was a great walker, which was his general mode of transport. He would often be seen on the surrounding roads, lifts were always refused with profuse thanks. His family vault will now be long gone. The manor House and other buildings behind the church have gone, in the vicinity of which is the new primary school. A path through the churchyard joins Vicar’s walk to Church Lane. This was a very scary place when all the headstones were still there and we would only walk through in groups. To the left of Church Lane separated by a high wall is Owlett Hall, now the home of a famous local historian. The grassed area opposite was where the tennis courts were and where we played tennis. Later I believe it became a bowling green. Further on Cross Street standing out is the Bourne Primitive Methodist Chapel now demolished but tastefully replaced by a row of modern cottages, the whole building designed in such a manner that it resembles the old chapel. Behind the white building in a square is the Red Lion, recently developed as a modern restaurant with prices typical for such restaurants. The helpings are reasonable; I have never had a whole crab before with a crab salad starter. Continue west along Cross Street, the three storey white building was the Manse for the Primitive Methodist minister. The building before that the home, shop and rear premised of Couches, grocers and animal feed merchants. They had a large family about seven or eight. The oldest and last survivor Marion is in her nineties resident in the Rest Home at Althorpe. Fate, especially the war did not treat the Couches very kindly and in spite of the large family there were no grandchildren. It started with a daughter initially fit and healthy developing heart disease and dying in her twenties. Years later Marion was to ask me why? The cause is complicated and only of medical interest. Bourne Chapel on Cross Street 1950s. North Street can be seen but I can make out little else, in this the earliest part of Crowle to be settled. It does not stretch as far as Commonside and the Old Don Drain. 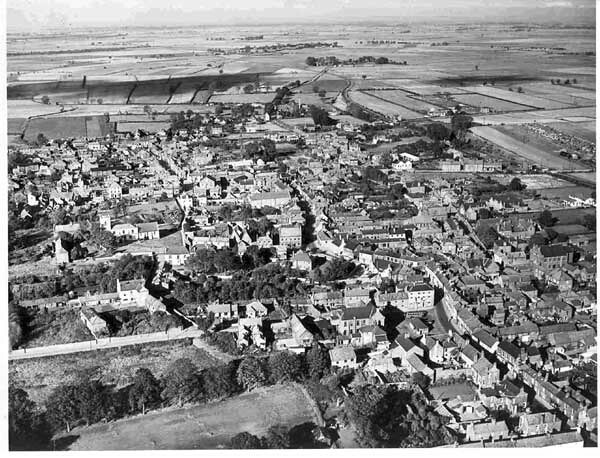 The High Street and Fieldside were laid out in the thirteenth century when the Bishop of Selby decided to develop Crowle into the Market Town for the north of the Isle of Axholme, prior to that some markets had been held at Garthorpe. If you look carefully you can see the messuages of the original plots. A messuage a long narrow strip with the shop or workshop and dwelling place at the front, with outbuilding and gardens at the back. That may be the reason High Street was called Front Street and Fieldside, Back Street when I was a boy. Now let us go to the right hand corner and the start of High Street, just where Pott’s Lane is. The white walled building in front where there is now a car park was the home of the Shillitoes. In front along High Street was their store, a single storey building. Mr. Shillito was a general dealer, dealer in cattle feed, gardening and farming equipment. His wife ran a penny library. There I was sent each week to renew my fathers and mothers’ books. Dad, having spent the ages of 18 to 28 in Canada was mad about Westerns, my mother, soppy romances. Selection was easy, in books they had read was a mark. I cannot remember the exact numbers but in dads the holes in an 8 would be blocked of and my mothers on of the 0s. Opposite the first shop, now an Estate agent was Mr. Wright’s, Baker and Grocer, southern branch. Mr. Wright, JP and County Councillor and his wife lived in the large double roofed house to the rear of the shop. Their daughter Margaret married Jeff Ramsden of Tetley Hall, a marriage that reached its diamond anniversary some years ago. Mr. Wright was classed as Independent as were all our councillors, we only had one political party, the Labour party, who never won any seats. The Attlee government of 1945 to 50 had discussed the possibility of nationalising the land, which is probably why. At the end of that row is a single roofed building, the home of Mr. and Mrs Brookman , Mr. Brookman worked for Mr. Wright. Kath Sykes their daughter is the same age as myself and went to the Technical High School at Scunthorpe, known as the Brown School whereas the Grammar School where I went was known as the Green School. Her older brother, a handsome dark-haired chap, had a hobby most males envied. He played the drums for Vin and his All Girls Accordion Dance Band. Mothers were very happy for their daughters to play in the band. They were well aware that they were in no danger from Vin who played the piano. Vin was later to “come out” and eventually changed his name to Vanessa. In actual fact Vin had no need to “come out”; as far as Crowle was concerned he had been out for years. We lads thought that the mothers ought to take a closer look at the lad on the drums at the back, but they were just as safe. Ron had already met Phyllis another marriage that must be getting pretty close to its diamond anniversary. Bill Spivey, Joseph Spivey’s younger son lived on the left of the road. I think it was the house with the large garden. I cannot remember the name but this car was designed about 1896. Bill had won many prizes, but some said it was a fraud. A clapped out rusty bit of tin to start with, Bill was a brilliant engineer and metalworker, he made many of the parts himself, so many some folk said it was a new car. Opposite can be seen what is now a Chinese takeaway, Mr. and Mrs. Jennings’s Fish and Chip shop. A packet of chips, one old penny, fish, twopence, both threepence and for fourpemce you could go into the little dining room next door and have fish, chips and peas with a plate of bread and margarine plus a large mug of tea. There were 240 old pennies in the pound. Next we come to the Post office and dress shop run by Mr. Raper’s sister and her husband and then Raper’s grocers, which he had made into a Spar mini-market. Next we come to the White Hart the Oldest Inn in the Isle of Axholme, which is mentioned in the M/S in a Red Box, the well-known novel about the drainage of the Isle. 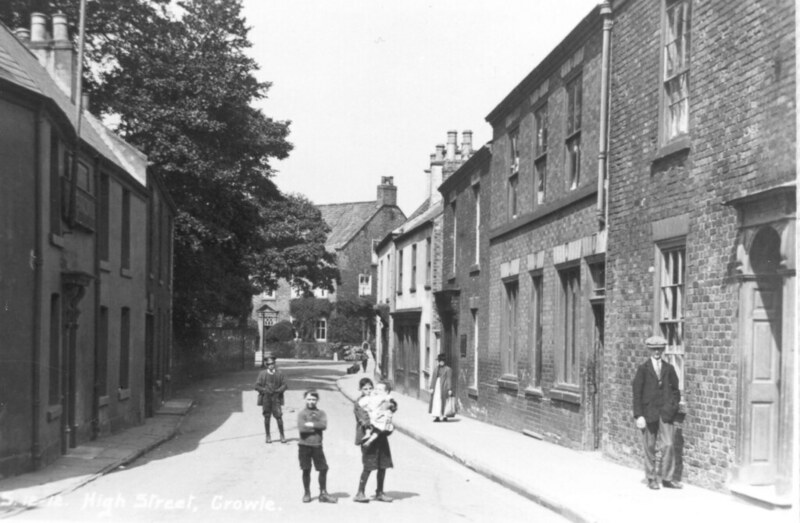 I cannot remember the landlord’s name and at that age, the son of rampant Methodists, dare not enter it, but as a very young man could not avoid noticing and admiring his very handsome daughter, a few years older than myself, walking through Crowle. Olga, I believe the young lady was called and was said to be the reason that a recently deceased Yorkshire and English fast bowler, could be found drinking at the White Heart. In spite of her apparent charm, I have been informed that the young lady never actually married. We now come to the Market Square. The first shop, now a bakers, I remember well, it was where I suffered from a dentist visiting from Epworth. I cannot remember his name, but his daughter was in the same class as I was at Scunthorpe Grammar School and became a lawyer so I will have to be careful what I say. A very intelligent girl but not much else going for her. The dentist had not got a university degree but acquired a registerable Diploma whilst being trained in the army. (So I was told) Modern high speed air-powered and water cooled drills had still to be invented. My dentist used the old-fashioned foot powered treadle and steel drills not the modern high-tension titanium steel ones. My teeth had been fully sorted out before I left for university and within a month I had to have one removed at the Dental Hospital. You cannot see it but the bank was on that corner a predecessor of what eventually became NatWest. open every Friday. That was another of my duties; I carried out all my father’s transactions through the bank. I was not a junior member, all my gains, ill-gotten and otherwise, were hidden away in a Post Office account that I made sure no one new about. The most important change is the toilet block in the Market Square, replacing stone steps in the centre that had been there over two centuries. There had also been a hand pump so that you could water the horses but that had ceased to function 50 years earlier. It had also been the site of the central market streetlight ever since the gasworks opened. It was not there in 1951 when I started university. The bus I recognise without a doubt, it was green, Ben’s Bus, based in Swinefleet travelling from Goole to Crowle and back three times a day, with an extra journey on Saturdays, picking up young cinema goers from the road ends leading from Ousefleet and other Ouse side villages becoming overloaded in Eastoft with those from Garthorpe and Luddington all heading for the second house at the regal cinema. I have described this in greater detail in the transport section of Crowle at War. The Police Station at the left hand corner was still functioning, with Sergeant Flynn back in charge. 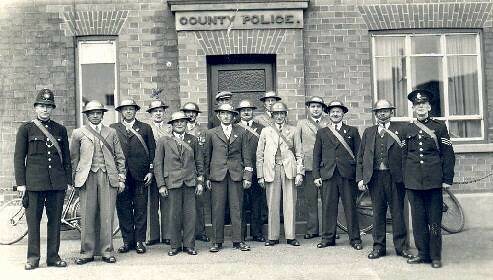 Induction of Special Constables in 1938, Sgt Flynn on the left. The Town hall still active with Saturday night dances and other functions, in July 1954 my twenty-first birthday party for example, when I officially became an adult and could vote. Directly across the Cross Keys, still a busy inn. The houses and shop to the west still not demolished. This had been the branch surgery of our GP Dr. Dickinson replaced two or three years before the NHS started by Drs Boyle and Collins. Dr. Dickinson suddenly sold his practice and disappeared. Why no one knew. Eventually it was rumoured that he had been divorced, in those days rare and a serious slur on one’s character. Dr. Dickinson was the same age as my father and they had been friendly at Glossop Grammar School, my father always wondered where he had gone until in 1968, shortly before I became a consultant, he received a letter from him. Dr. Dickinson had moved to central Lancashire and had been in practice with his son. He was now due to retire and they had not been able to find a replacement. He had heard through the grapevine that I had qualified in medicine and would I be interested in joining the practice. The effect of the letter was wonderful to behold. My dad did his nut. The b—–d had never let him know where he was and now when he wanted something he was in touch. He could “Rot in Hell” “ get stuffed” and other colourful phrases. He never answered the letter and I was banned from answering it. In fact I was to busy with my own career and thought no more about it. A decision I now regret. I should have visited him just to say hello and taken the three kids and a highly pregnant wife with me as well. Personally I do not think Dr. Dickinson was all that he was cracked up to be, with a good reputation amongst the Methodist in contrast to Dr. Strachan who would often visit his patients in the evening with the aroma of his favourite Scottish beverage wafting in the air. I was later to get to know Doc. Strachan very well and although Drs Boyle and Collins were good I reckon he out classed the lot. I suspect that Dr. Dickinson is responsible for something I have missed all my life, siblings, a decision I made after studying the history of midwifery. I had the unusual experience on the night before getting married, whilst helping my mother to wash up, of explaining to my mother, what Family Planning meant and what a contraceptive was. This firmly drilled home that being an only child was not planned. My parents married on 1st August and I arrived 7th July the following year and I was breast fed for about 9 months. Obviously my parents were a fit healthy fertile couple, so why don’t I have a brother or sister about two years younger. The reason is that my father employed a GP to deliver my mother instead of a midwife. I suppose it was a natural decision since they had been friends at school. A midwife is present throughout labour; a doctor is not he has other patients to see. GPs then were in competition with midwives and did not want to share the fee, so mothers nursing aids were employed. My mother thought hers was great; she stayed for 10 days and did all the housework. These nursing aids would also supervise the labour and keep the doctor informed how it was progressing. This would include vaginal examinations and the nursing aids had not undergone the strict instruction of cleanliness and infection control that midwives have. Year after Year in the 1920s and 1930s at the Annual General Meeting of the British Medical Association the obstetricians proposed that nursing aids should be banned and only midwives allowed to assist doctors in the management of labour and year after year the more numerous GPs voted against. Maternity was a too important source of income. I firmly believe that through carelessness Dr, Dickinson or more likely his nursing aid caused my mother to have a low-grade infection, which sterilised her. My last visit to Dr. Dickinson was about the age of 10, I had been messing about at Len Slingsby’s next door and deeply cut my left thumb on the door catch. It soon stopped hurting and I neglected it, not washing it or getting it dressed. Within a few days I had red lines on my arm and swollen tender lumps in my axilla. It could have become serious. I was prescribed M & B 293; massive big white tablets one of the first and favourite sulphonamides before penicillin became available. The visit, enter the front door, the waiting room was to the right, a bell rang and I went into the surgery, which was divided into two parts, the examination area and behind a white wooden wall the dispensary, filled with various coloured bottles, pills bottles full of greasy stuff the base for ointments. Here Dr. Dickinson dispensed his commonest prescriptions, mixed his own bottles and his own ointments. This latter was to disappear with the NHS except in rural areas, which were over three miles from a chemist. At the corner of the Square we enter the Johnson’s Lane. I got into serious trouble with my father when we visited the first house on the right hand side. I would be about 8 or 9. They had a daughter who was obviously a mentally handicapped, bald and overweight. I must have spent the visit staring at her, which is why my father was so annoyed and played hell with me afterwards. It would have been better if I had been warned beforehand. There was similar woman who lived with the blacksmith at the top of Godnow road. It was before the Welfare State and wherever possible people in the villages tried to look after them themselves, only disruptive ones would be admitted to the asylums. The word Bracebridge (In Lincoln) was a word of family shame. Hardly any of these mentally handicapped people were Down’s Syndrome (or Mongols which is now politically incorrect). Many Down’s syndrome people have heart abnormalities and before the advent on penicillin most died in early childhood from heart infections. Cross over the square to where the Undertakers shop is. That was a paper shop and general store. The owner’s husband had a lucrative sideline. He had bought an old van and two dozen of the latest, extremely expensive, electric washing machines, which he hired out by the day, delivering in the morning and collecting in the evening, a mobile launderette. On the corner after the chemists before the alley to Back Street was a furniture store The shop half way along the next block was Peck’s Butchers, where my mother got all her meat especially when rationed during the war. You could always sell rabbits, hares and pheasants to Mrs Peck at the back door. At that time pheasants were not as plentiful as now and any pheasants we caught went into the pot at home. In may seem strange now but by the time as I was 8 I was a dab hand at applying a rabbit chop, back of the rabbit’s neck with my right hand and then skinning and gutting a rabbit, and plucking and drawing game birds. Directly opposite Peck’s was a very good single storey greengrocer, the roof of which can just be seen behind the Cross Keys. On we go to Key’s Hardware shop on the corner, now Brian Chafor’s. Mr. Key on retirement built the first house on the west side of Wharfe Road, between the Red House and the stack-yard of Snowdrop Villa, now both demolished and built over. West Terrace Street can just be seen but the three little terrace cottages have been demolished. The middle cottage was occupied by the never to be forgotten Granny Harper and her family, her son Billy who spent most of his time in the pub across the road, granddaughter Shirley or Sheila, grandson Frankie and a lady of indeterminate status. I did not know if she was Granny Harper’s daughter or Billy’s wife, but was the source of the rare baby that came along. We will meet Granny again when I discuss the school. Opposite Chafor’s is the George and Dragon. Further along on the white house and shop, Mrs. Horry’s sweetshop. Malcolm Horry two or three years older than myself went to the Grammar School and then studied medicine at Sheffield University. He became a GP, I believe. Mrs Horry sold the shop to her cousin Mrs. Garland whose attractive daughter went to the Technical High School. She married and still lives in Crowle. (No Names). In the sixth form both schools often met socially and the daughter became friendly with one of my pals in the sixth form, Albert. Albert, asked me to look after the daughter and ensure she got home safely. I started to pick her up from home and we went together to Scunthorpe, I went of with my friends male and female and Albert picked the daughter up, both often coming along with us. This resulted in an altercation at home, which followed the following dialogue. I was incensed I nearly attacked that 14 stone of solid muscle. To suggest that two of my friends would behave in such way was atrocious. Although I am a now a bit more worldly wise, youngsters did get carried away even in those days. It was pre-contraceptive pill and pre freely available abortion. Getting a girl pregnant could ruin your future and it would certainly have ruined hers. Next we come to the double fronted Cooperative Store opposite the previously mentioned New Vicarage and War Memorial. That and the next properties on either side of Chancery Lane have been demolished. 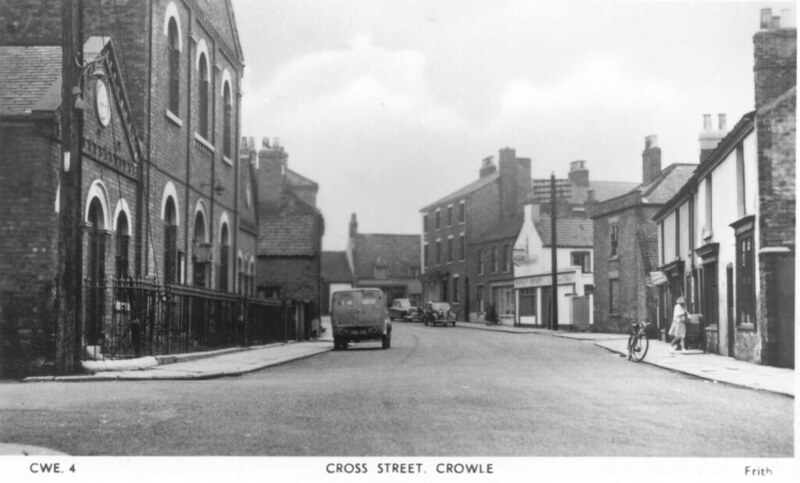 Replaced by the library and clinic on one side and the Crowle Resource Centre on the other. Church Street is directly opposite, this street and Cross Street being planned in the 13th century development to join the old and new towns together. The large Edwardian house is still there, but there has been development in the gardens alongside High Street, which used to be separated by a high wall, there are bungalows there now. The next but one building, double fronted with narrow spire like roofs was the Church School or National School. The school dates back to the seventeenth century, when three houses, with extensive commons rights and ten acres were bequeathed to the parish for the education of the poor, by Richard Brewer in 1687, Thomas Walkwood in 1697 and Richard Clark in 1721. The land and common rights were exchanged for 21 acres, 3 roods and 10 perches of tithe free land and £206 at the time of enclosure. The latter sum was spent in repairing the buildings and the Charity Commissioners for National Schools appropriated the charities. Continuing up High Street we can see the awnings of several shops, first Pidd the Pork Butcher, then Pidd ordinary butcher, another shop and then the head quarters of Wrights, Bakers, confectioners and grocers, opposite Printing House Lane. In addition to Mr. Brookman, Tommy Stringer was a senior employee. Tommy was one of our Sunday school teachers at Fieldside and our choirmaster, working extremely hard to ensure or Sunday School Anniversary, was a success. Tommy well died two or three years ago well into his Nineties. About five years ago after an interval of over three decades I dropped into his little flat to see him. I have never seen anyone so delighted. We talked for hours. Tommy admitted however he had had enough, the end could not come fast enough when he would be with his beloved wife again. Tommy a thoroughly committed Christian was absolutely sure they would be together again. There had only been the two of them, no children. Tommy had the faith and with a faith like that, I do not think he would be disappointed. Then a whole row of shops I cannot recognise Seniors the Gentlemen’s hairdresser, but Sam’s the barbershop opposite Dysons has not yet been demolished. The Regal cinema is on the right. Three shows a week, Monday and Tuesday, Wednesday and Thursday and Friday and two Houses on a Saturday, 6 pm and 9pm. Bill Spivey ran it and when just after the war films were registered U any one, A under 16 must be with an adult and X, no one under 18. I had a serious problem, like us Bill lived on Wharf Road with a daughter at the Grammar School a year younger then me. I could wangle my way past the ticket office at Epworth and the Scunthorpe cinemas but getting past Bill before the age of sixteen was impossible. One of the shops opposite the cinema was Haighs, where all the during war and the rationing afterwards we were registered with for our sweet ration, 4 ounces each. Every Friday I would buy our sweet ration, of which we always had a 2 ounce Mars bar, which I divided carefully into three later in the evening. Strangely as soon as sweets came of the ration we stopped buying them. The building beyond the cinema ended on the corner with Dysons, the drapers, where after starting university, I stocked up on my clothing, saying “ Put it on my dad’s account.” And disappearing back to Manchester before he found out. There were about three other shops at the front, one of which was Ovingtons, where we got our boots and shoes. Strict Methodists attending Fieldside they suffered another tragedy their son an only child was killed in a motorbike accident. There were too many of these tragedies in the Isle of Axholme at that time and having seen the effect on the parents, made me resolve as a teenager never to have a motorbike. We then cross the start of Cross Street, on the other corner we went up steps into an off licence, where in summer we would go to buy glasses of Lemonade, Dandelion and Burdock, Tizer, Cream soda and the like. Later in our teens we could also buy glasses of Bulmer’s Cider. My mother a strict TT was aware of this, but assumed that anything made from something as benign as apples could not possibly contain alcohol. The off-licence at the top of Cross Street, taken after Pidds and Sams had been demolished. Opposite on the corner as mentioned was Sam’s and another Pidd’s butchers with abattoir behind. Both now demolished with a little park there instead. Then Woodlands Avenue, difficult to make out, but the buildings beyond the large house have been cleared and the Crowle Community Centre built there instead. We then reach Pinfold Corner often known as Doctors’ Corner, where the white Baptist Chapel is prominent. That is where Fieldside (Back Street) ended, so I will deal with that next. The first large building on the left is the Metodist Church, originally the Wesleyan Chapel, built in 1904 replacing an earlier building on that site. The Methodists of that era were numerous and optomistic as the laying of the foundation stone shows. Opposite marked with a small arrow is the Sunday school building, built some 60 or 70 years earlier. All early Methodist building had them, prior to the 1870 education acts; they were important places for the education of both children and adults in the basics of reading writing and addition. The congregation has shrunk to such an extent and the Sunday school for children no longer exists, so that the building can no longer be maintained. It is to be converted into three one-bedroom dwellings maintaining the outer façade. It was used for all the secular activities of the church. Anniversary teas, Christmas parties, Harvest festival sales, bazaars, jumble sales, weekly meetings of ladies groups such as the W. I. and the Boys’ Brigade. That is where my parents celebrated their silver wedding, making it a fund raising occasion for the church, all invited or wishing to attend bought half-crown tickets (£ 0.125%). It was where I had my wedding reception and I attended many friends wedding receptions. A non-conformist church without a Sunday school is a dying church and although it nearly breaks my heart to say so, I have my doubts as to whether there will be any Methodist Church in Crowle in two decades time. I was baptised, married and had all my children baptised in that church. Back row. Doris and Fred Goldthorp, William and Margaret. Front row/ Suzanne, Jennifer and Richard. The buildings on either side of the road have been demolished. The small R/ C School can be seen it has been enlarged, then the substantial R/C Church and Preceptory. They are having the same problem as the rest of us, no longer one or two resident priests, the church is served by a priest from Gainsborough. Many of the large seminaries for training R/C priests have had to close. At least the Anglicans and the non-conformists have the advantage?? ?, although still controversial in some quarters of having women vicars and ministers. That church is situated opposite the end of Chancery Lane. Next on the right is the old Congregational Chapel, used as a meeting hall in 1950. There were two elections in that year, the Attlee Labour government won the first by about 6 seats and unable to rule with such a small majority lost the next to Winston Churchill’s Tories by a majority substantial enough for him to have a stable government. Hi there, just to say I have really enjoyed reading your story. 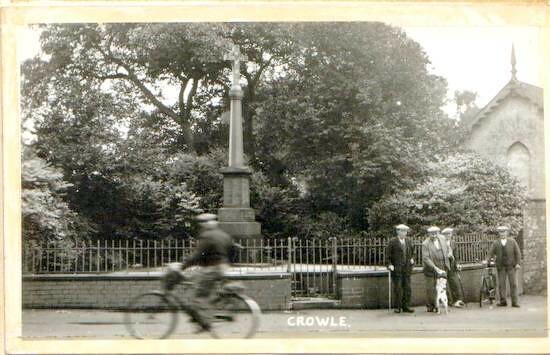 I am researching my ancestors, many born lived and died in Crowle. My Gt Gt Uncle John Isle ran the Public House once called The Three Horse Shoes and renamed St Oswaldo Arms which was opposite The Red Lion I do believe before it was demolished. I am searching for any old photos of the pub. Unfortunately it isn’t mentioned in your wonderful story but do you have any memories of it .